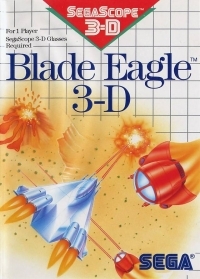 Description: Blade Eagle is designed for play in conjunction with the Sega 3-D Glasses. If you play without the 3-D glasses, it will look like as if there are two of your ships, not just one. If there are four enemies approaching you, they will look like eight. Box Text: It began with the evil Arvians, aided by robot drones programmed to destroy, struck without warning. In days, the three worlds of your solar system were under siege. One ship escaped capture...yours. Now only you have the power to return freedom to the solar system. That's because you have the BLADE Eagle, the most powerful one-man fighter in the fleet. You'll need every trick in the book to maneuver through 9 levels of the most true-to-life 3-D battleground ever created...and hordes of virtually indestructible mechanical monstrosities. 01-29-2016 Flashback2012 Box Text It began with the evil Arvians, aided by robot drones programmed to destroy, struck without warning. In days, the three worlds of your solar system were under siege. One ship escaped capture...yours. Now only you have the power to return freedom to the solar system. That's because you have the BLADE Eagle, the most powerful one-man fighter in the fleet. You'll need every trick in the book to maneuver through 9 levels of the most true-to-life 3-D battleground ever created...and hordes of virtually indestructible mechanical monstrosities. The odds are a million to one against success. Anyone taking bets? 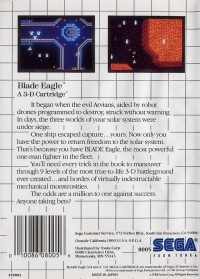 This is a list of VGCollect users who have Blade Eagle 3-D in their Collection. This is a list of VGCollect users who have Blade Eagle 3-D in their Sell List. This is a list of VGCollect users who have Blade Eagle 3-D in their Wish List.